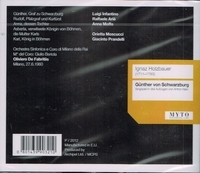 "GÜNTHER VON SCHWARZBURG is a Singspiel in three acts by Ignaz Holzbauer set to a German libretto by Anton Klein. Loosely based on events in the life of the 14th century German king, Günther von Schwarzburg, the opera premiered on 5 January 1777 at the Hoftheater in the Mannheim Palace. GÜNTHER VON SCHWARZBURG was the first full German opera score to come off a printing press. The beautifully engraved edition was published by the Mannheim firm of Johann Michael Götz with a dedication to Karl Theodor: ‘the most illustrious patron of music under whose august protection the Palatinate Theatre has first praised a German hero. "Gerd Albrecht was a prolific recording artist who spent almost his entire career in Germany with the exception of posts at the Zurich Tonhalle and Danish Radio and four years (1993-96) when he was controversially elected chief conductor of the Czech Philharmonic Orchestra and subsequently deposed. In the introduction to the German edition of my book THE MAESTRO MYTH, I reported that Albrecht had won the Czech vote by promising a record contract that he could not deliver. Albrecht applied to have the book banned, but the judicial process never got off the ground after Czech musicians supplied me with the incriminating faxes. In the immediate post-communist confusion, a part of the orchestra had become bedazzled by the prospect of western wealth. Albrecht’s Wikipedia entry describes his period in Prague as ‘a musical success’. Not many who heard the orchestra in that time would share that conclusion. It was an unhappy period, ending in a bust-up with the President, Vaclav Havel. Albrecht left behind a deeply divided orchestra. He was invited back for further engagements at the 2004 Salzburg Festival and for a 2006 South America tour. The orchestra has lately reverted to Jirí Belohlávek, the music director whom Albrecht displaced. From 1997 to 2007, Gerd Albrecht was principal conductor of the Yomiuri Nippon Symphony Orchestra in Tokyo. Since September 2012 he has been musical director of the Besançon International Music Festival. "Soprano Anna Moffo was born in Pennsylvania in 1932 of Italian parents. After a period at the Curtis Institute, she went back to her ancestral homeland to study in Perugia and Rome. She made her début in 1955 at Spoleto, as Norina in DON PASQUALE, but her big break came when she starred as Cio-Cio-San in MADAMA BUTTERFLY in a production broadcast on RAI. She became an overnight celebrity, with performances at Salzburg, Vienna, La Scala, and Naples, performing with Callas, di Stefano and Panerai, and making recordings with Karajan. She made her Met début in 1959 as Violetta, one of her signature roles. In 1948, Luigi Infantino made his début at the Teatro alla Scala in Milan, as Nadir in LES PÊCHEURS DE PERLES, later singing Ramiro in LA CENERENTOLA, which he also sang that same year at the Verona Arena. The tenor sang regularly in Naples and Bologna, and made guest appearances at the New York City Opera in 1947: LA TRAVIATA (with Enzo Mascherini as Giorgio), RIGOLETTO (opposite Giuseppe Valdengo and Virginia MacWatters), MADAMA BUTTERFLY, LA BOHÈME, IL BARBIERE DI SIVIGLIA (conducted by Julius Rudel) and DON GIOVANNI. In 1949, the tenor went on a concert-tour of England and Australia. In 1954, at the Teatro Fenice in Venice, Infantino sang Edgardo to the Lucia of Maria Callas, in LUCIA DI LAMMERMOOR. At the Teatro dell'Opera di Roma, he created AMLETO, by Mario Zefred, in 1961, and LA STIRPE DI DAVIDE by Franco Mannino, in 1962. In 1964 Infantino reprised his rôle of Edgardo at the Bombay Opera in India, with soprano Celia Baptista as his Lucia. He was also active throughout his career singing on Italian Radio (RAI), where he gave his last performance in 1973, in Mannino's IL DIAVOLO IN GIARDINO. “Raphaël Arié was never as well known as his two great compatriots Nicolai Ghiaurov and Boris Christoff, but he is the third in the trinity of great Bulgarian basses. Born in Sofia he studied with the important pedagogue Christo Brambarov who guided his pupil’s career with care and caution. He won the Geneva singing competition in 1946, continuing studies in Italy with stellar figures such as Stracciari and Granforte and soon made a name for himself in Prokofiev, in BORIS and DON GIOVANNI. He performed widely in Italy and France in particular – though in 1953 he was chosen as the Commendatore for a Salzburg Festival performance under Furtwängler – even if he made Rome his base. His successes in the Italian repertoire were many, his forays into German opera (much less lieder), few.